WWOOF (World Wide Opportunities on Organic Farms) is a fantastic organisation that matches people from all over the World with volunteering opportunities on organic farms and small-holdings in the UK. We have been members since our sons, Tom and Alfie WOOFed in New Zealand. Since 2010 we've hosted over 70 WOOFers for between two weeks and three months. They live with us as part of the family and help in the bakery, with pizzas, in the veg garden and on the wood stack. Many return and we include them among our extended bread family. We have travelled the World vicariously with them and we are happy to give WWOOF a huge plug. 2019 - We are not taking WWOOFers at present as we have sons and returning WOOFers helping out. Our bakery is built upon the energy and creativity of the people who have passed though our lives as apprentices, leaving recipes and laughter behind and taking away the confidence to follow their passion. Lynne Watson came as a WWOOFer wanting to know about wood fired ovens. 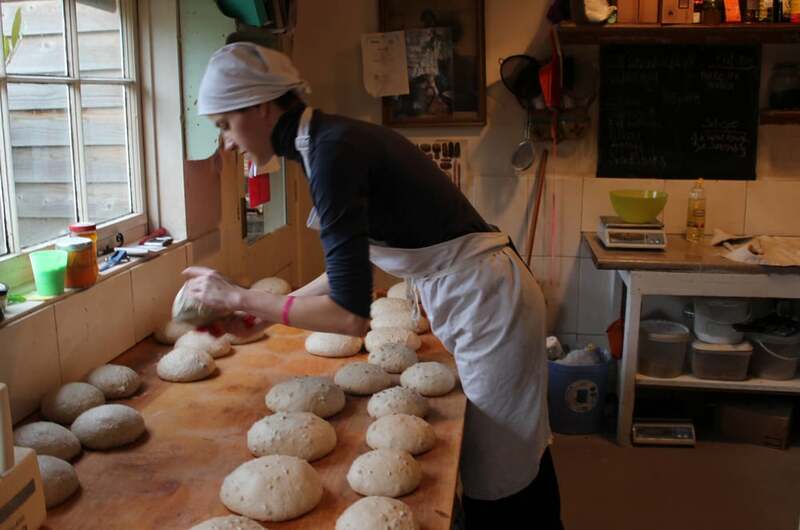 She knew a lot about bread and brought with her our first rye sourdough recipes. Lynne suggested we couldn’t continue to build the bakery without regular help and so our apprenticeships were born. Thank you Lynne. No money has changed hands and we are much the richer for having all of you... Kristyn Carrol (USA), Rachel Baker (Bristol), Franck Leys (France), Brianna Ralston (USA), Naomi Harris (USA), Lee Dodge (Brighton), Rachel Fearon (USA), Robert Hiller (Belgium), Tony Homfray (Totnes), Mike Cormier (USA), Tatjana Stojanovic (Serbia), Antony Hubbard (Swindon), Lisa Morton (Somerset), Toby Mann (Guernsey), Cajsa Ohlsson (Sweden), Fleur Hoyle (Bristol), Claire Pennel (Australia), and Adam, Alex, Leonie, Phil, Meredith, Shauna and Wenjia (see more below). Adam came to us from Scotland and after the first month knew he was a baker at heart. Adam stayed longer than most, having made himself indispensable. He left to travel to the bakery of another apprentice, Meredith, In Florida and returned to work at Leeds Bread Co-Op. Adam rejoined us in March 2016 and we helped him and another apprentice, Fleur Hoyle set up a new bakery at White Post, Langford Budville, some 4 miles away. Adam and Fleur ran White Post Bakery until January 2018. Adam is now baker at De Superette Bokrijk Bakery near Antwerp. 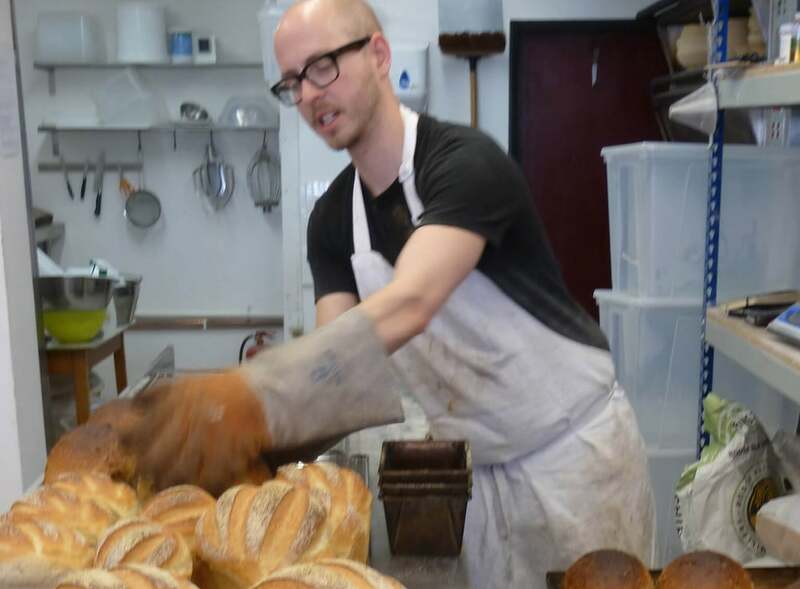 Alex already knew he wanted to open a bakery in Bristol when he came to us and he focussed on perfecting his sourdough. He certainly did that – Alex’s East Bristol Bakery won the Best Bristol Bakery in the Bristol Food awards in 2014 and goes from strength to strength. Leonie thought she wanted to be a chocolatier until she discovered sourdough. After leaving us Leonie got a job with Alex at East Bristol Bakery where she still works part-time while training to be a mental health nurse. Another of our WOOFers, who also did a short stint in the bakery, Rosy Benson joined East Bristol Bakery in Autumn 2015 and now works at E5 Bakery on London. Phil perfected the art of Ciabatta here – getting up earlier than anyone ever had before. It was worth it. After leaving us Phil got help from the Princes Trust to set up his bakery Hemmings Bakehouse. Phil sells his bread and pastries at markets in the South East at Sissinghurst and Gillingham. Meredith came as a WWOFer and because our apprentice Shauna had problems with the UK Borders Agency Meredith took her place as apprentice and stayed on for as long as she could. Thank goodness she did. Meredith’s award winning Community Loaves bakery in Jacksonville Florida is just amazing! Shauna is a warm hearted Canadian who, in spite of immigration hassles, was determined to come to Tracebridge. She baked with us one Autumn and left with lots of ideas about baking in the community, setting up a bakery in Pittsburgh, which has received a lot of attention. She was even asked to bake bread for Michael Pollan, one of our food heros. We were impressed. Wenjia also came as a WOOFer and realised that she wanted to be a professional baker so she returned later in the year as an apprentice. Her plan is to open a bakery in her hometown of Nimbo in China. She has returned to China and we wish her well. She has all the drive and talent to make it work. Wenjia also took most of the lovely Summer photographs for this website.